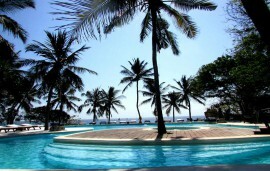 Driftwood Beach Club overlooks the blue waters of the Indian Ocean, and is located on a beautiful tropical palm fringed beach just south of Malindi on the Kenyan coast. 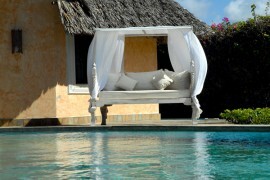 Driftwood has preserved the essence of a traditional Kenyan beach holiday – tranquil, informal, fun and relaxed. Drift Wood Beach Club has unique and intimate accommodation in ensuite cottages and villas which are either sea view, pool view or garden rooms. All rooms are air conditioned, have mosquito nets, standard 240v sockets and a telephone.The club has the best pub in town and wonderful fresh seafood. It combines hospitality, relaxation and informality – all at its best! It also offers world class deep sea fishing and adventurous Scuba diving. Their gardens are well manicured with beautiful long palm trees and well manicured grass. From the gardens there is a view of the ocean offering a panoramic back drop for weddings.